Is your trenching bucket with ejector tired ? The rust or the exterior elements defeat your ejector buckets ? Shock damaged your ejector bucket ? No problem, we have what you need ! CODIMATRA, specialist in the purchase and sale of second-hand spare parts and construction equipment, has selected for you a complete range of ejector buckets compatible with most existing equipment. What is the role of an ejector bucket ? What distinguishes a conventional trenching bucket from an ejector bucket is the metal plate that is located inside. This plate allows the compacted soil to be ejected into the bucket. Indeed, the shape of the trenching bucket is very particular and its geometry is optimized for high precision work. But these buckets are often very narrow and the earth remains blocked inside. The ejector plate makes it easier to work with the operator. The trenching buckets with ejectors are made from high strength steel which makes them very robust. A wide range of ejector buckets from CODIMATRA. 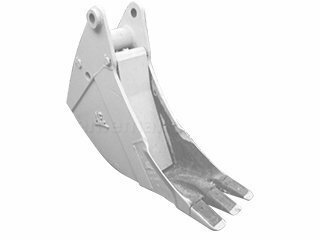 Our dedicated list of trench buckets with ejector is updated daily so that each customer can find the product that perfectly matches his machine. To help you choose the model of ejector buckets you need, call on the expertise and professionalism of the CODIMATRA’s teams. They are at your disposal to answer all your questions or for any additional information.